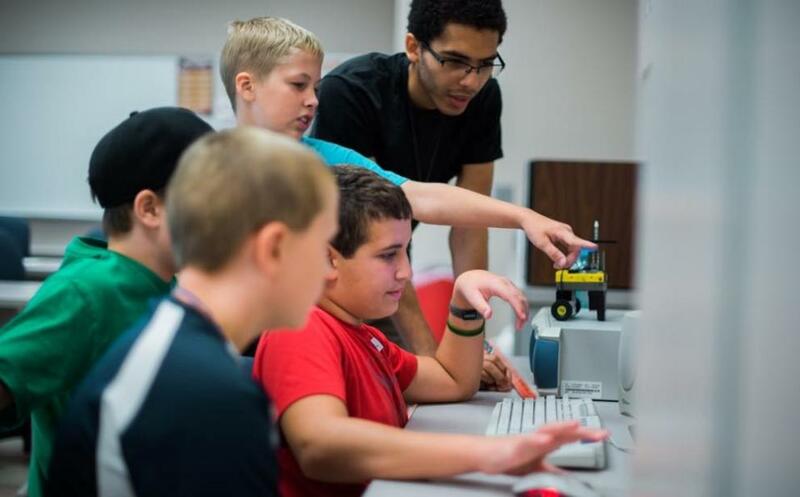 Pitt State faculty conduct the workshops within the laboratories and classrooms of the Kansas Technology Center available in several different sessions to accommodate as many young minds as possible. A fast paced look at the materials, processes, and design methods involved in the construction industry. Students will receive first hand experience on material classification and usage. For children ages 9-14. Attendees must be 9 years old by July 1st! Level I: July 8-12, 1:00 p.m. to 4:00 p.m.
3D Building Modeling, Problem Solving, Bridge Building, Safety, GPS and other activities. Level II: July 15-19, 1:00 p.m. to 4:00 p.m.
3D Building Modeling, Problem Solving, Bridge Building, Safety, hands on activities including: building walls, pouring concrete, laying brick & building a dog house. Hands-on workshops for children on the topics of teamwork, programming, brainstorming, construction techniques, robotic basics, and electro-mechanics. Each robotics session is $100. Read more details on the Robotics FAQs page. We provide a supervised place to eat lunch for students that want to attend both afternoon and morning sessions. Those planning on staying during the lunch hour will need to bring a sack lunch. Camp instructors respectfully request that children leave fidget spinners, tablets, and any devices that "distract from the learning environment" at home.